FleetWeb™ Intelligence Visualization Suite: Visualize, Analyze, Act. July: Check out the latest edition of FridayFleet! This is where Donlen’s FleetWeb Intelligence Visualization Suite comes in. Donlen’s new fleet management business intelligence tool, the FleetWeb Intelligence Visualization Suite, summarizes your fleet’s performance using intuitive, easy-to-understand, and actionable charts and graphs to help you improve productivity and reduce unnecessary spending. “Our FleetWeb users, including many fleet managers, have been dealing with big data for a while now. To help them, Donlen developed a tool that could quickly and visually be used to identify patterns and provide insights leading to reduced spend, increased safety, and improved compliance. This tool allows many, including non-analytical users to data mine large data sets and gain key insights easily and efficiently,” said Adam Oxer, Donlen senior business intelligence analyst. Donlen’s Visualization Suite currently consists of seven visual dashboards that cover all aspects of your fleet, with each dashboard containing interactive, easy-to-understand charts and graphs that summarize your fleet data. The dashboards available in the Visualization Suite include: Fleet Composition, Fleet Trend Overview, Acquisition, Fuel, Maintenance, Accident, and Remarketing. With your fleet’s KPIs displayed in a graphic, ready-to-share format, you can quickly and easily identify trends and opportunities and make meaningful decisions to make your fleet more efficient. Take a look at the gallery below to see some of the Visualization Suite's powerful dashboards. With all of your fleet data displayed in an easy to read visual format, you can spend less time managing and organizing your data, and more time analyzing it to identify fleet performance opportunities. With fleet professionals consistently being asked to deliver new strategies for reducing fleet spend and improving performance, it is critical for trends and opportunities to be identified quickly and easily. The Visualization Suite summarizes the KPIs that are driving your fleet’s performance, empowering you to make meaningful and timely decisions. “The Visualization Suite not only summarizes your fleet performance, but allows you to quickly analyze what is driving your performance, and provides insights that allow you to take action right away,” said John Wuich, Donlen vice president business analytics. Providing flexible and interactive data visualizations to better display performance metrics. Revealing trends to turn data into actionable insights across all aspects of your fleet. Delivering insights with data visualization that anyone can use. Giving you a new perspective into your fleet’s productivity. With our new suite of business intelligence tools, you will gain better insights and bigger results. 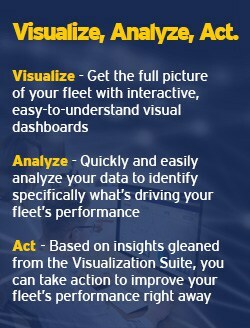 Visualize, analyze, and act to drive your fleet’s performance with Donlen’s FleetWeb Intelligence Visualization Suite. Request a demo to see how you can drive your fleet’s performance with the FleetWeb Intelligence Visualization Suite.